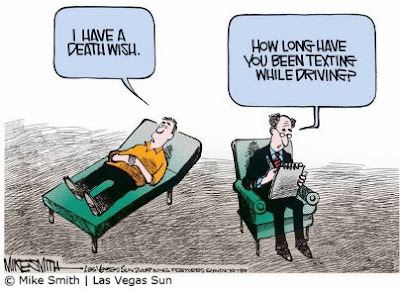 I think it's a great idea to ban texting while driving along with physically holding the phone to your ear. It's a distraction and people drive horribly enough without that adding to it. If someone really has a need to text and can't wait til they get to the office, they should pull over. Other than that they should be using a hands-free device for voice conversations. The irony here would be if someone picked up their cell phone to take a photo of someone using their cell phone while driving to report it, and then got pulled over for holding their mobile while driving. At least you'd have a good reason and photographic evidence to support your claim. Ha ha ha! Brad- LOL. There was a study that hands-free devices don't reduce driver inattentiveness by much.